How about some honey-sweetened chocolates for your honey…or for anyone who doesn’t like refined sugar? One of our favorite booths at a particular trade show is Queen Bee Gardens, which makes delicious honey-sweetened chocolates and other confections. The older, homespun couple at the booth differ from the trendy staff at other booths. But their chocolates are always a welcome respite on the tasting trail. We always stop for a sample, passing by many other booths with “been there, had that, pass ‘em by” chocolates. In northern Wyoming, in a valley at the foot of the Rocky Mountains just east of Yellowstone National Park, sits the small farm where Clarence and Bessie Zeller raised a family of six. To support the family, they produced honey. The hives were started from angry wild bees Clarence’s father found along the Shoshone River. In 1976, the Zellers decided to expand into honey candy, using an old family recipe from Bessie’s ancestors in Scotland. Queen Bee Gardens chocolate contains no sugar, just honey. Photo courtesy RealFoodTraveler.com. More recipes were developed. Pecan Pearls are melt-in-your-mouth honey pecan pralines. 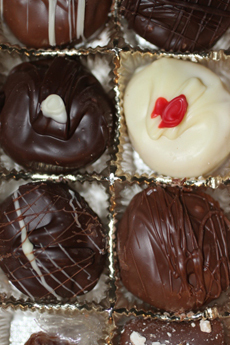 Truffles, English toffee and other mouthwatering confections also delight. A red heart-shaped box of chocolate truffles is $25.17. The Queen Bee Gardens website is very plain, but these farm folks know how to make confections that are anything but plain.